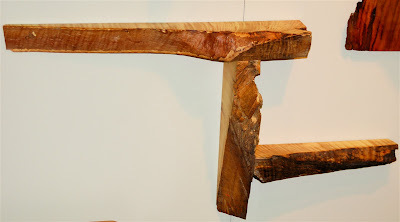 Washington, D.C., woodworker and Etsy seller A. Drauglis hand crafts simple but beautiful shelves that celebrate the natural form of the wood from which they're made: The surfaces are cut clean and scraped smooth, but the edges are left as nature made them, tree bark and all. 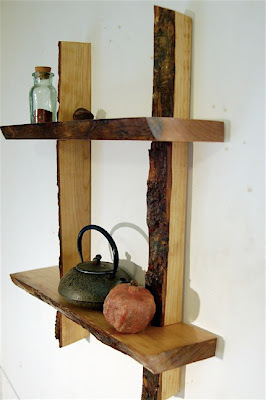 The result is something that would be equally at home in a rustic cabin, a minimalist loft, or a "zen modern" home. 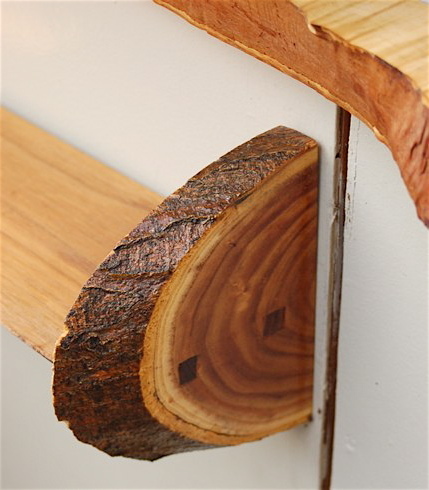 Drauglis' shelves come in a variety of sizes, configurations, and wood species, including the walnut-and-mimosa No. 1, $40, top; the cherry No. 12, $75, above; and the curly maple No. 13, $60, below. Visit Drauglis' Etsy shop right here, and see some of his hand-crafted furniture and other large pieces here.